The Oklahoma Sooners are ranked No. 21 in Sports Illustrated's 2015 college football preseason Top 25. Don’t believe everything you hear, says coach Bob Stoops. While popular chatter in Norman would indicate that the quarterback battle has already been decided, “that couldn’t be further from the truth,” says Stoops, who will give Texas Tech transfer Baker Mayfield (the Big 12 Offensive Freshman of the Year in 2013) a chance to unseat junior Trevor Knight (179-of-316 passing for 2,300 yards, 14 touchdowns and 12 interceptions) in fall camp. While Stoops has defended his program after a disappointing 8–5 season, he made eight changes to his staff, highlighted by the hiring of East Carolina offensive coordinator Lincoln Riley. An Air Raid disciple, Riley won’t give up on the ground game—not with 5' 11", 237-pound sophomore Samaje Perine, who last year set an FBS record with 427 rushing yards against Kansas. 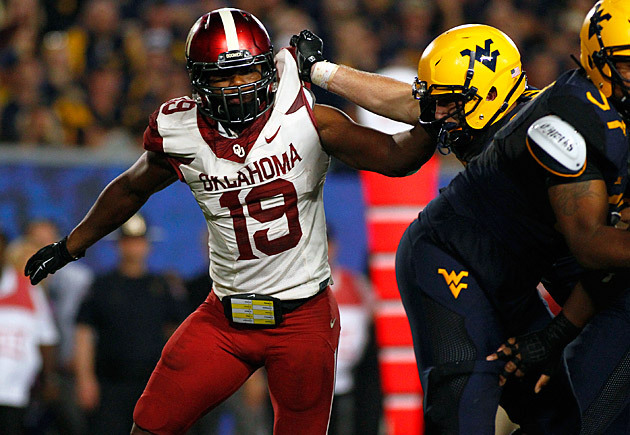 After switching to a 3–4 defense in 2013, the Sooners will incorporate more 4–3 this year to cater to senior linebacker Eric Striker’s strengths. They have other effective run-stoppers in junior Dominique Alexander (107 tackles) and redshirt senior Frank Shannon (92 tackles in 2013, suspended for ’14). The problem lies with the secondary, which gave up 276.2 yards passing per game last season, the most in school history. It’s going to be a different scenario with Lincoln Riley calling the plays, so they’re a bit of an unknown. I imagine they’ll try to throw it more, but with [running backs] Samaje Perine and Joe Mixon, they’ll find a way to get them the ball too. If you look closely at what Riley did at ECU, he’s good at adapting to the personnel he has ... When you’re on offense, Stoops brings pressure from everywhere. Every week it’s new looks, new blitzes. You have to be ready for any and everything. He wants you to make a mistake ... Talent-wise, they’re always going to be right at the top of the conference; overall, they’re just a solid defense. You’ve got to make them pay on some of the aggressiveness they bring each week. When they take a shot defensively, you have to respond immediately. After being suspended for his freshman season because of a misdemeanor assault charge (he took a plea bargain), running back Joe Mixon (6' 2", 217 pounds) will have an instant impact. Mixon hasn’t played in a real game since 2013 at Freedom High in Oakley, Calif., when he ran for 1,704 yards and 23 touchdowns. A gifted receiver, he’s an ideal fit for the Sooners’ new pass-heavy offense. After going 8–5 last year, OU can’t afford to take anyone lightly. A Sept. 12 game at rising Tennessee should tell Bob Stoops a lot about whether his new offense is working, and don’t be surprised if Texas pulls an upset on Oct. 10 in Dallas. The toughest stretch is mid- November, when the Sooners face Baylor (away), TCU (home) and Oklahoma State (away) with no bye.